We will learn how to find the equation of a straight line in normal form. If the line length of the perpendicular draw from the origin upon a line and the angle that the perpendicular makes with the positive direction of x-axis be given then to find the equation of the line. 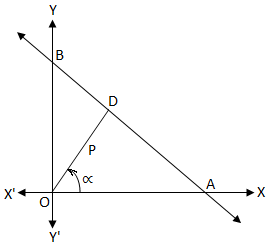 Suppose the line AB intersects the x-axis at A and the y-axis at B. Now from the origin O draw OD perpendicular to AB. The length of the perpendicular OD from the origin = p and ∠XOD = α, (0 ≤ α ≤ 2π). Now we have to find the equation of the straight line AB. ⇒ x cos α + y sin α = p, which is the required form. Find the equation of the straight line which is at a of distance 7 units from the origin and the perpendicular from the origin to the line makes an angle 45° with the positive direction of x-axis. We know that the equation of the straight line upon which the length of the perpendicular from the origin is p and this perpendicular makes an angle α with x-axis is x cos α + y sin α = p.
⇒ x + y = 7√2, which is the required equation. (i) The equation of a, straight line in the form of x cos α + y sin α = p is called its normal form. (ii) In equation x cos α + y sin α = p, the value of p is always positive and 0 ≤ α≤ 360°.